How to land an investment banking interview? When it comes to investment banking, perhaps the first city that is granted to come to one’s mind is New York. With Wall Street having become a synonym for the whole industry, it is hardly surprising that the city has been attracting the best investment bankers not only from every corner of the US but from around the world for decades. Even the financial crisis which hit Wall Street particularly hard was not enough to erode the appeal of the Big Apple. Represented by Wall Street in Lower Manhattan, New York is often referred to as the finance capital of the world. NYC’s economy is the largest regional economy in the United States with the finance industry being one of the biggest contributors to the city’s coffers. New York’s dominance as a global financial center dates back to the early 20th century. The New York Stock Exchange, located on Wall Street, and the NASDAQ, the world’s first electronic market, are the world’s biggest stock exchanges in terms of market capitalization and average daily trading volume, respectively. In addition, the Federal Reserve Bank of New York, also based in the city, is considered the most influential of the 12 regional Federal Reserve Banks. New York is a favorite spot for bulge bracket banks, being the home of giants such as Goldman Sachs, JPMorgan Chase, Morgan Stanley, Citigroup and Bank of America Merrill Lynch, all of which usually occupy the top spots in charts measuring M&A activity. International investment banking groups such as UBS, Credit Suisse, Deutsche Bank and Barclays also maintain a significance presence in the city. While for the aspiring investment banker those names have a near-mythological status, landing a job in one of them is a real possibility, given the right set of finance skills. Sure, the bar is very high, but it’s still designed to be passed. And yet, bulge bracket firms are not the only thing that New York has to offer for those seeking an investment banking career. Breaking into the finance industry can also be done via landing a job in a smaller, boutique investment bank, of which NYC has plenty. Yet, the appeal of New York’s finance industry is not strictly limited to investment banking. With the city being one of the most important financial centers in the world, it is logical to assume that it is also attractive for the private equity industry. It is enough to mention a couple of names such as Blackstone which is headquartered in the Big Apple, and KKR which keeps several offices in the city, according to its website. 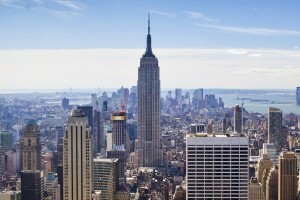 Prospective venture capitalists can also make it in New York; while San Francisco is often the preferred spot for those looking to kick off their career in the venture capital industry on account of its proximity to the Silicon Valley, New York has always attracted budding entrepreneurs and, by implication, venture capital companies wishing to invest in them. Another factor which makes NYC stand out for those looking to pursue career in finance are the unparalleled exit opportunities which the city offers after investment banking. Networking opportunities are also aplenty on account of the number of people working in the finance industry. The appeal of New York for investment bankers, however, lies way beyond the boundaries of Wall Street and lower Manhattan. It would hardly be a surprise that NYC is one of the best cities in the world to live in if you work in finance assuming you’ve had the right exposure to financial modeling and investment banking training. Despite the lengthy commutes and the notorious traffic jams, the Big Apple features some of the best shopping, dining and nightlife in the world. Despite the financial crisis, NYC remains one of the most important centers of the financial industry worldwide and that is reflected in the career opportunities available. The downside? Just like New York is known as the city that never sleeps, its investment bankers are known for pulling all-nighters and generally, are said to be working more on average than their peers elsewhere. Still, the city remains the ultimate destination for those seeking to pursue the investment banking career path and climb the corporate ladder, and for a good reason; there’s no other place in the world where investment bankers feel more at home than on Wall Street.